VICTORIA, BC – As first announced in early March, Vancouver Island Brewery has crafted a new beer in honour of the 100th Anniversary of the Canadian Navy. 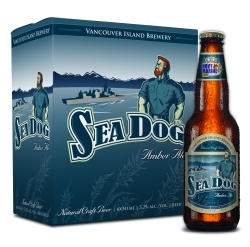 Sea Dog is an amber ale fashioned after the German Altbier style. Like a true Altbier, it is fermented with ale yeast, but at a colder lager temperature. This gives it a clean finish with no esters like a lager, but retaining the malty quality of an ale. Its deep copper colour comes from a heavy addition of dark crystal malt, and a touch of chocolate malt. Sea Dog is lightly bittered, so as to not mask it’s intense maltyness. Most of its hop character comes from a heavy dose of Willamette and Hallertauer hops at the very end of the boil. Sea Dog Amber Ale is available now on draught in pubs and restaurants in the Victoria area, and in 6-packs at BC government and private liquor stores. The best beer this brewery has made since the West Coast Wheat. The brewmaster seems to have a real knack of creating bavarian inspired beers that Van Isle drinkers strive to find. With 4 great local breweries its great that VIB is finding its niche again. They are the perennial leader of craft and they should rightly take it seriously. Well Done. Anyone know if I can find and purchase this beer in the lower mainland.